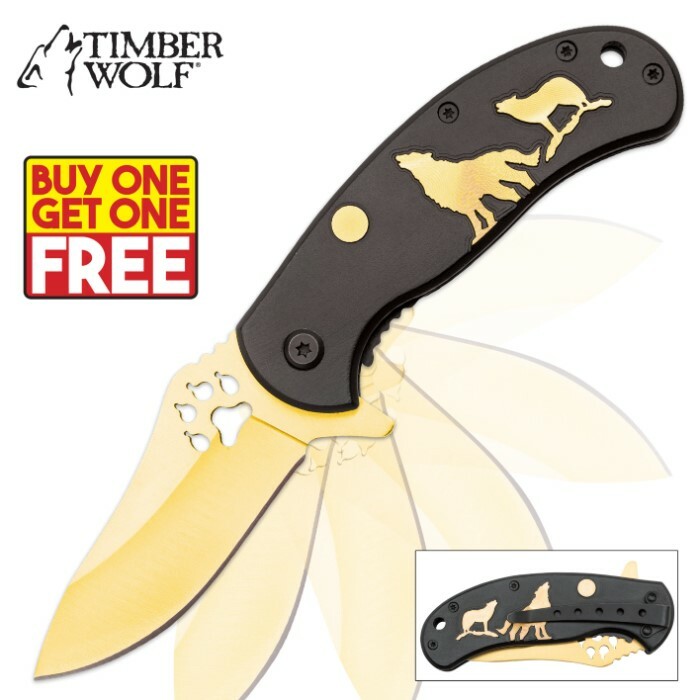 Timber Wolf Pack Leader Gold Bladed Assisted Opening Pocket Knife - BOGO | BUDK.com - Knives & Swords At The Lowest Prices! Timber Wolf has unleashed the ultimate "Pack Leader" with this assisted opening pocket knife. It features an aluminum handle with a smooth black finish and a gold coated silhouette of two wolves howling under a full moon. The razor sharp 3" AUS-6 stainless steel blade is gold coated for superior performance and appearance, and includes a snazzy paw print cutout. It opens effortlessly; just a touch of the flipper and it flies open at impressive speed, thanks to the advanced assisted opening mechanism. At 3 3/4" closed it's easy to carry, especially with the integrated pocket clip and lanyard hole. You get two of these Pack Leaders for the price of one!